The VIR is a state of the art electronic module created by GG, this latest GG innovation has taken 3 years in design and production. The reason for the size is part of the design, Imeo wanted to make something very small to reduce the overall size of the mod. As well as the size the main purpose of VIR is to offer a product that does more than provide a good vape, it offers a much safer vape. 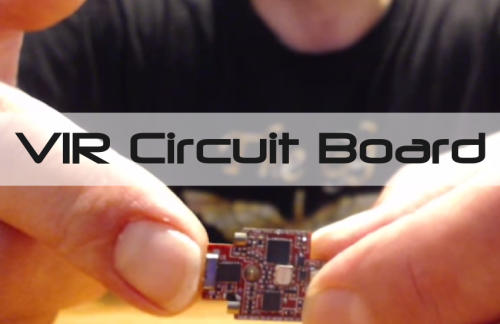 It achieves this in a number of ways all powered by the tiny PCB which is the heart of VIR. The technology behind VIR is all programmed into a unit the size of a thumbnail. The VIR introduces a new paradigm in the vaping world, Imeo himself describes it as: "Real Greek Magic". An smart electronic module that understands your style of vaping. It is not a temperature limit protection device, it is the first electronic module that provides real temperature control: you vape all the time at the specific configured temperature. The VIR is patent pending under the 20140100215 patent number. OBI: Industrial Property Organisation (οργανισμος βιομηχανικης ιδιοκτησιας). For operation guide see the Proteus section. 3 Years of research and development. Prevents inhalation of acrolein (produced when VG gets beyond 290°C). Can sense a non fed atomizer and prevents dry hits. Will not allow the wick to get dry, thus prolonging the life of the wick. Prevents wire from getting red hot: prevents oxidation. Checks the wick 1000 times per second, leading to consistent flavour. Parallel coils work with all the same functions. Control of vapor on atomizers with liquid control, especially on GG devices. Allows control of the vapor temperature. Through control and management of the current, VIR prolongs battery life. Performs the same regardless of the gauge of the wire used. Keeps vape consistent between atomizers with different resistances. Can sense overfed atomizer, and sends the correct power to remedy the flooded atomizer. Understands when you are not inhaling and cuts off after a few seconds. Gives a coloured LED signal depending on type of the detected wire. Detects available battery power and gives an LED signal when vaping falls below normal setup. Gives power when inhaling (if button is pressed without inhaling the power goes down): This provides protection for unlocked devices,as for example when carried in pockets. All changes work in real time, no need to stop and check settings. You know the temperature at which your atomizer works. "Strong / Weak" battery check. Ability to stop LED flashes by pressing 1 time the button. Detect lower and higher limits of temperature range. Remembers your last set up. 0.45 - 2.2 Ohm resistance range. Atomizer won't work while pushing the button to enter the menu. Menu won't trigger by mistake, ie when using short button push inhales. Battery will work until it reaches 3,4 Volts. Brass electrical contact points (old alloy). Min-Max operating coil temperature: 180°C-280°C. Supported resistances: 0.45 ohms to 2.2 ohms. Supported coil materials: Titanium Grade 1. Supported wire gauges: from 0.2 mm to 0.6 mm (from 32 AWG to 23 AWG). Locking / Unlocking: 5 button clicks. Over discharge battery protection: 3.3v. *Note: (with VIR unlocked) Press 3 times the button and keep it pressed. VIR will show the current configured step or temperature, by an orange blinking LED: One blinks = 180°C... ...Eleven blinks = 280°C. Fast blinking: Not enough liquid / not inhaling. Slow blinking: Waiting for an already detected1 atomizer (for a max of 6 seconds2). 1 To change the atomizer remove the current atomizer and wait for 6 seconds until the green and blue LED is off (VIR will forget the atomizer) and connect the new atomizer, the atomizer detection phase will start. 2 To have more than 6 seconds to work with an already detected atomizer, without losing its configuration (i.e. type of wire detected), you can lock the VIR by clicking the button 5 times before removing the atomizer or while in the 6 seconds range. Tip: VIR will remember your latest configured step, even if a new atomizer is installed and wire detection process was executed. Stays on for 0,5 second after 2 seconds of inhaling: Not enough battery power for the selected configuration (it will still functioning at the maximum power that the battery can supply. In other words, it will keep operating at lower temperature (step) than the selected, as there is not enough battery power to achieve the selected step)1. Slow blinking: Atomizer / Wire type detection process. Fast blinking: Short circuit detected. 1 It is important to note that it could happen even when the battery is fully charged and the selected step is the lower one. For example, in a situation of an overfed atomizer, in which the excess liquid will keep the coil at lower temperature than the configured at the selected step. Solid (1 second): Locked device (after clicking 5 times the button). 3 Blinks: Unlocked device (after clicking 3 times the button). Tip: You can stop any LED signal at any time by clicking one time the button. Orange: (solid, 2,5 seconds) Titanium grade 1 wire detected. Purple: (solid, one second) Other coil materials detected (as Kanthal, Nichrome, etc). This page was last modified on 19 February 2019, at 16:01.